I think dust is probably one of our greatest inhibitors to a nominal operation on the Moon. I think we can overcome other physiological or physical or mechanical problems except dust. One of the most aggravating, restricting facets of lunar surface exploration is the dust and its adherence to everything no matter what kind of material, whether it be skin, suit material, metal, no matter what it be and its restrictive friction-like action to everything it gets on. On Mars, surface and atmospheric dust may be even more detrimental to the human health and exploration than on the Moon if only because much longer expected exposures. The Apollo 17 astronauts spent a total of 75 hours on the Moon with their three extravehicular activities (EVAs) lasting a total of 22 hours and 4 minutes. By comparison, astronauts on Mars may spend up to 500 days on the surface of the Red Planet with EVAs of much greater duration than the Apollo astronauts, thus greatly extending the exposure time to atmospheric dust on Mars. In addition, the atmosphere of Mars includes a myriad of trace chemically active atmospheric gases that can lead to the production of toxic species. These may be deposited to the surface of Mars and directly on atmospheric dust particles. Mars atmospheric and surface dust must be assessed for its impact on human health, the operation of Mars surface systems and surface operations and exploration. A major finding of the Viking mission was the discovery of a persistent atmospheric background of dust ranging in diameter from less than 1 to more than 10 micrometers, resulting in an atmospheric dust opacity (tau) ranging from a few tenths to more than one at visible wavelengths. This persistent background of fine dust is responsible for the pinkish-reddish color of the atmosphere of Mars. During dust storms, the opacity of atmospheric dust can increase to a tau of more than three. The surface of Mars is very dusty, covered with unconsolidated soil and dust that is readily transported into the atmosphere by horizontal and vertical winds. Mars is well known for its localized, regional, and planetary-scale dust storms. 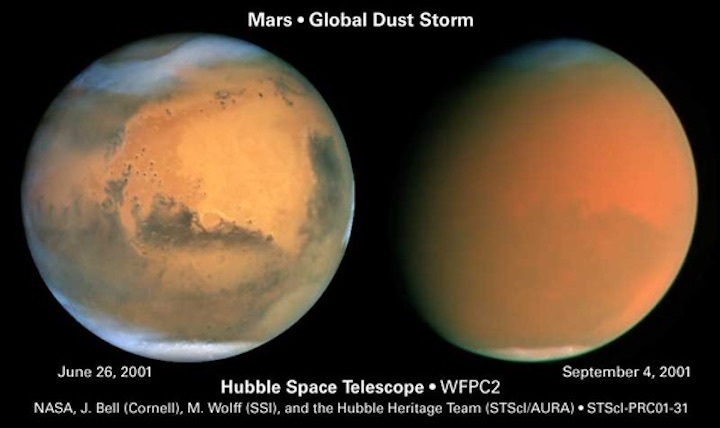 An an example, see the two photographs of Mars taken by the Hubble Space Telescope shown above: the left photograph taken on June 26, 2001 shows a “clear” Mars and the right photograph taken on September 4, 2001 shows Mars almost obscured by airborne dust. 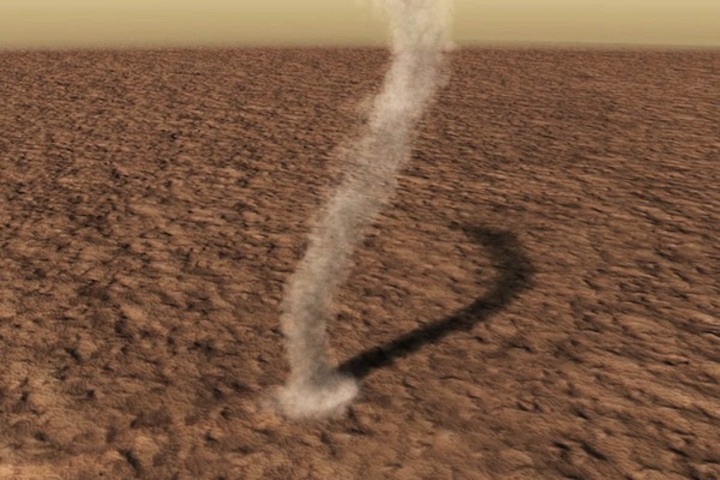 Localized, small-scale dust devils are also a regular feature of the Mars atmosphere, as shown below. Measurements of a regional dust storm in 1977 obtained by the Viking Orbiters led to an estimate of the mass of dust associated with this regional storm of about 430 million metric tons (see Martin, T. Z., 1995: J. Geophys. Res., 100, pp. 7509–7512). Viking Orbiter measurements were also used to deduce the mass of atmospheric dust associated with a localized dust storm near Solis Planum as about 13 million metric tons of dust lofted into the atmosphere (Martin, 1995). Mars atmospheric and surface dust must be assessed for its impact on human health, the operation of Mars surface systems (e.g., spacesuits, habitats, ascent rockets, etc.) and surface operations and exploration (e.g., reduced atmospheric visibility, limited EVAs, hampering of regular habitat maintenance, etc.). Two earlier studies have considered the impact of Mars atmospheric dust on human exploration: Safe on Mars: Precursor Measurements Necessary to Support Human Operations on the Martian Surface published by the National Research Council (NRC) in 2002 and An Analysis of the Precursor Measurements of Mars Needed to Reduce the Risk of the First Human Mission to Mars published by the Mars Exploration Program Analysis Group (MEPAG) in 2005. The NRC and MEPAG reports discussed the impact of Mars atmospheric dust on human health, including astronauts inhaling airborne particulate matter, toxic metals (e.g., hexavalent chromium, a highly toxic form of chromium in Mars soil and airborne dust), and potentially toxic atmospheric gases. In 2008, after the publication of the NRC and MEPAG Mars reports, the Phoenix Mars lander discovered compounds of perchlorate in the soil of Mars. The presence of perchlorate in the soil of Mars has now also been confirmed by soil measurements obtained by the Curiosity Mars rover. Perchlorate has been shown to interfere with the normal iodide uptake by the thyroid gland, and thus has been added to the list of potential toxic compounds in the soil of Mars. Due to concern of the possible negative impacts of Mars dust on human health and the human exploration and surface operations on the Red Planet, the NASA Engineering and Safety Center (NESC) organized and held a workshop titled “Dust in the Atmosphere of Mars and Its Impact on Human Exploration” at the Lunar and Planetary Institute in Houston on June 13–15, 2017. Approximately 100 participants, including Mars scientists, mission engineers, mission architects and mission planners, medical researchers, and students attended the workshop. In a series of invited plenary papers, specialists reviewed the chemical, physical, and electrical properties of Mars atmospheric dust, the evolution, nature and occurrence of localized, regional and planetary-scale dust storms, the human health effects of Mars atmospheric dust, including inhalation of and potential toxicity of dust particles and the impact of Mars atmospheric dust on surface systems and on surface operations. Abstracts of the eight invited plenary papers and two dozen contributed papers are available on the conference website. To better understand the role of the omnipresent atmospheric dust in the potential transport of Earth microorganisms around Mars (forward contamination) and the role of atmospheric dust in transporting possible Mars microorganisms back to Earth with the astronauts and their equipment (back contamination). In the report to the NESC, the workshop organizers recommended how these gaps in our understanding may be addressed prior to humans setting foot on Mars using future robotic missions presently being planned and by laboratory experimentation and computer modeling simulations.